Fran Drescher came by to talk to Kelly & Michael. Michael said she “always makes us laugh.” Michael said that they needed extra security for her. She didn’t know why, she’s the most accessible celebrity. She answers everyone’s tweets. She’s addicted to it. She got it two or three years ago. She talks to her fans a lot. Her fans are very creative. The Tonys are Sunday, June 8. Drescher’s presenting. She has the third fitting for her dress tomorrow. She tries not to eat, but she keeps eating anyway. It’s hard to eat healthily when you’re doing a show, but she’s very excited for her dress. It’s an original. They talked about Drescher’s Broadway debut in Cinderella. She pointed out that her role has the biggest speaking part, but the smallest singing part when they approached her and they said, “Yeah, we know.” She thought it was funny though. Kelly was surprised that this is her debut. She’s done off-Broadway though. They’re at the Broadway Theater, which is one of the biggest theaters, now. They also rewrote the story and modernized it. Cinderella is apparently a stronger character and the prince is the one who’s more lost. He’s the one who needs a woman to help him realize who he is. There’s also a revolutionary in the story now fighting for the underdogs in the community. That actually sounds awesome. Drescher said that men come because the women want to go, but everybody leaves saying how much they liked it. It’s also visually stunning. Kelly got to perform with the cast and got to wear one of the costumes a while ago. It was incredible, but it was cumbersome. They have physical therapists come for free every week just because of the costumes. 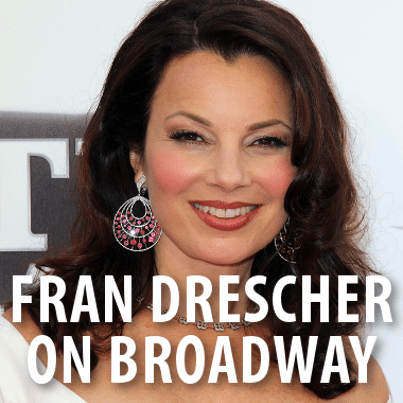 Kelly & Michael: Fran Drescher Taking On Too Much? Drescher said that you have to make sure that you don’t do too much in theater. She missed a line and said it was because her throat was hurting and she thought she would start coughing, but she was really distracted by thinking about her travel plans.